I’ll be posting a few videos by Garance Doré made during New York Fashion Week. I love that as a blogger Garance Doré is always challenging herself to make her fashion blog more innovative to her readers. She takes us into the shows and behind the scenes with her videos. Here’s a look at the Alexander Wang show. One of my favorite fashion blogs is Scott Schuman’s The Sartorialist. Here’s a video from his book signing for his latest book The Sartorialist: Closer. City Hall Weddings in New York-Part 2! Taras Dmytrenko and Dasha Shuster. Photograph by Winnie Au. A second beautiful slideshow of New York couples getting married at City Hall posted by Refinery29. Simple and romantic! Architect Jordan Tait and model Maritza Veer. Photograph by Winnie Au. Here’s a beautiful slideshow of New York couples getting married at City Hall posted by Refinery29. 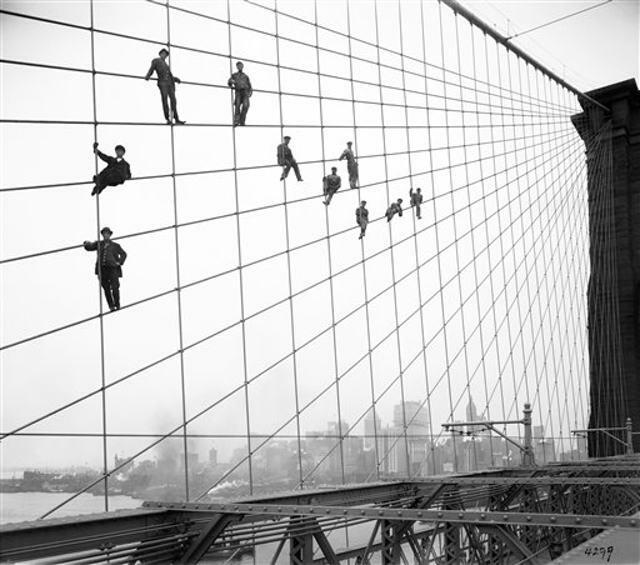 October 7th, 1914—painters in the wires of the Brooklyn Bridge. Photo by Eugene de Salignac, Courtesy New York City Municipal Archives. If you like looking at old black and white photos, then you will enjoy this! The New York City Municipal Archives has released more than 870 000 of their old photographs, which date back to the mid-1800s. You can check out a few examples at Gothamist or go directly to the New York City Municipal Archives. Pardon My French: Episode 3/Hey Ladies! Here’s the last New York episode of Garance Doré’s web series. Enjoy!